Nevermind, they do use 5457s as diodes in the original. Legs are gonna be a little funky in this layout but you can bend the middle leg over, tie the source to the drain off board, and then just put a dogleg bend in the gate to make it 4 rows wide. If I understand this correctly based on the pinout etc., G (pin 3) is connected to the positive rail and S/D (pins 1, 2) are connected to one another and the negative rail? I'm guessing D1 & D2 can be swapped with any other JFET or MOSFET (e.g. IRF520, J201)? They're just being used as clipping diodes, so I don't see why not, but it may not sound the same. Tag this one as verified, it’s a lovely muff variant! Cheers on the verification man. “Basically every 100nF” Is it actually every one? I’m not familiar enough with schematics to recognize a coupling cap. Thanks! 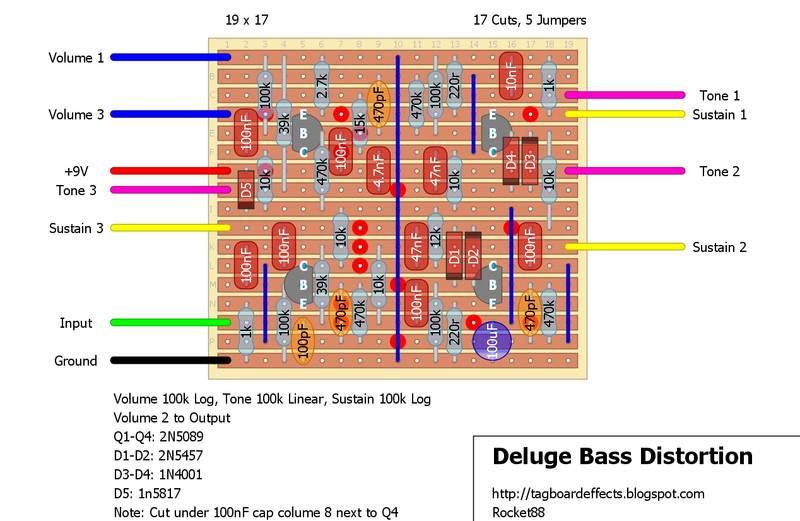 Hi there, I’m super new at this but wanna give a bass fuzz build a shot, and your layout looks really easy to follow except what do “cuts” mean on the wiring diagram? Exactly that; cut the veroboard track so that there is a break in connectivity, best to use a meter to test the cuts before any solder takes place just to make sure. Ok great, thanks for the help! 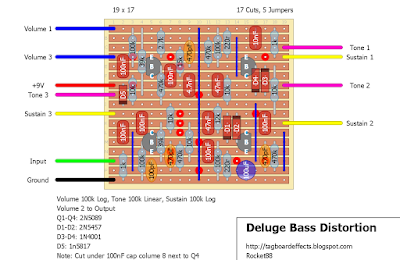 This thing becomes a REALLY great bass fuzz if you swap out the 1kΩ in the bottom left for a 330Ω (or thereabouts). Hi i have build this one but i dont get any gain any sugestions ? I am using a dpdt switch with Milenium true bypass, the schematics says that volume 2 hora yo output, to the Jack output ir the dpdt output? And also says that there is CUT under 100nF cap in columne 8, but there isn't any cap there, maybe is the columne 7?